Was Stonehenge Built Elsewhere and then Relocated? Stonehenge may have been built in Wales and then transported to Wiltshire, England, a new study suggests. Researchers at the University College London (UCL) analysed the bluestone rock that makes up Stonehenge’s smaller inner rings. After close examination, they tracked the blue rock back to Craig Rhos-y-felin and Carn Goedog, two rock quarries in Wales. This suggests that the Neolithic people who created Stonehenge may have built the prehistoric monument far away from its current location (Wiltshire). In the study, the researchers used carbon dating to uncover new information about Stonehenge. Since the builders of Stonehenge have left not written record behind, it is quite difficult for archaeologists to understand exactly what the purpose of the massive structure used to be. Mike Parker Pearson, an English archaeologist specialising in the study of the Neolithic British Isles of the UCL Institute of Archaeology, said that Stonehenge was originally a Welsh monument. If the monument in Wales – from which Stonehenge was created – can be found, it will probably answer the age-old question as to why Stonehenge was built and why some of the stones were transported so far away from their initial location, Pearson added. The age of the bluestones suggest that Stonehenge may have been built in Wales and then carried in pieces to its current location, according to the researchers. Parker Pearson said that the Craig Rhos-y-felin stones date back to 3400 BD, and the Carn Goedog stnes to 3200 BC. However, the blue stones only arrived at Stonehenge by 2900 BC or so, he stated. Professor Parker Pearson said that it is highly improbable that it took almost 500 years for the Neolithic Stonehenge-builders to get the rocks from Wales to Wiltshire in England. A more plausible explanation would be that the stones were used in another local monument at first, and then were taken apart and brought to Wiltshire, according to Parker Pearson. Professor Kate Welham, of Bournemouth University in England, said that after conducting trial excavations, geophysical surveys, and aerial photographic analysis, archaeologists may find something big in 2017. 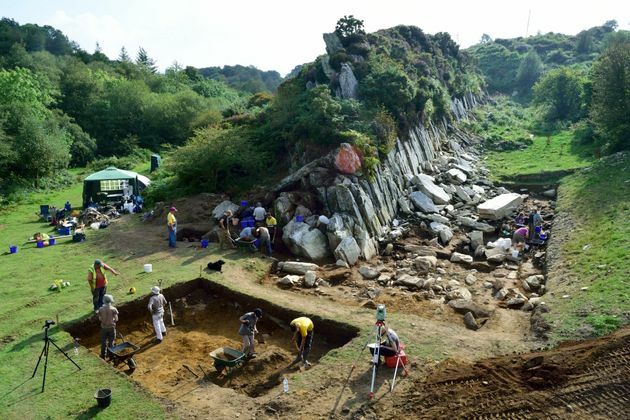 To make more precise determinations, the researchers will conduct further excavations at the Carn Goedog and Craig Rhos-y-felin quarry sites. IS STONEHENGE ROMAN?The title is very misleading. When you read the post there is nohintg in it suggesting Roman or Roman-era authorship. At most they speculate that some re-arrangement, tidying-up, may have been done at that time, nohintg more. Known datations are much older.But maybe the Roman occuptaion had beneficial effects for the preservation of the monument somehow.